My love doesn’t buy much records. When I first met her, 25 years ago, she had about an arm length of vinyl, half of which she had gotten as presents and had never listened to. It is not that she doesn’t loves music, she doesn’t care for possessions very much. For a die hard materialist like me, to have such a person around is a miraculous experience every day. It never stops amazing me. Last week she bought a CD. She buys one CD every one or two years. This time it was a CD by a girl she saw on television, Stevie Ann. She first went to a record store, but read on the CD that the CD was also for sale at Stevie Ann’s own website. I think this was not really the case, and that the CD finally enetered our home via Bol.com. 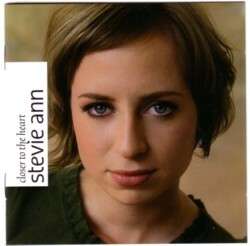 But anyway, we now have the CD Closer to the heart by Stevie Ann. I found out that Stevie Ann just has a second CD out; I guess that my love wanted that new CD, and that she ordered the wrong one. Not that it matters: I hear her playing the CD every now and then for the past few days. Which is strange because she rarely puts on a CD. I have no idea what she likes about Stevie Ann’s music. Well, no, I do have an idea of course, but I do not understand it. I have co-listened to the CD a few times, but the music did not touch me yet. And I am easily touched by music. Not being able to hear, see and feel what other people hear see and feel, is definitely Nature/Life’s greatest mistake.